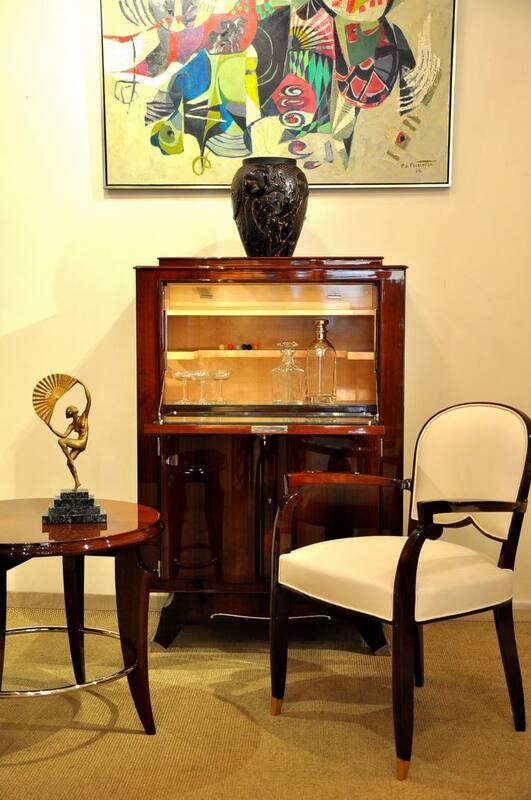 Opened in 1996 in Nice on the French Riviera and located in the heart of the antique dealers area ,our antique gallery offers furnitures , paintings, sculptures, ceramics, lighting, art glass and works . We are specialized in the Decorative Arts of the 20th century. Through the pages of this catalog you will discover the great designers of Art Deco period . The master glassmakers : LALIQUE , SABINO , ETLING , VERLYS , HUNEBELLE , LEGRAS , MULLER , Pierre D'AVESN , BACCARAT crystal , DAUM , SCHNEIDER , LE VERRE FRANCAIS , CHARDER , Julien VIARD , Jean PERZEL . The designer decorators , the architects , the cabinetmakers : D.I.M. Philippe PETIT René JOUBERT , JANSEN , Paul MONTAGNAC , Jean DESNOS , Maurice DUFRENE , Jules LELEU , Jacques ADNET , RAMSAY , Albert CHEURET , Léon et Maurice JALLOT , Michel ZADOUNAISKY , Paul IRIBE , Christian KRASS élève de RUHLMANN , Batistin SPADE , BAGUES , Gilbert POILLERAT , André ARBUS , Michel DUFET , Paul FOLLOT . Sculptors : Maurice GUIRAUD RIVIERE , Pierre LE FAGUAYS , Armand GODARD , Charlotte MONGINOT , Claire COLINET , Lucien ALLIOT , Eric GILL , MOLINS , Marcel BOURAINE , Alexandre OULINE , Max LE VERRIER , Edmond ETLING , Albert CHEURET , Jean Théodore DELABASSE.